I love having a beard for several reasons. Firstly, because I look like a small child when I'm clean shaven. Secondly, because it saves me a lot of time not having to shave every day. I don't think I even know where my old razor is any more. 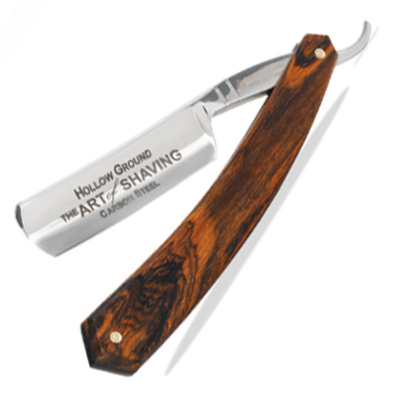 I thought I'd never miss shaving - but then I stumbled across an amazing shop: The Art of Shaving. I was in the Venetian Hotel in Las Vegas (a story for another day) when I saw this little place that had old-school razor in the window. I walked in and discovered some pretty cool stuff for the modern gentleman. These majestic shaving implements looked worlds apart from the little plastic Bic razors I had shredded my face with back in school. I decided there and then that if I was ever to take up the daily practice of removing my facial hair I would use one of these implements. Or at least that was what I thought before I inquired as to what these items costs. It was then that I was reminded of an important shopping principle: If the price isn't shown it's not gonna be cheap. The sales attendant informed me that the Limited Edition Rose Gold Safety Razor Shaving Set with Fine Brush (shown above) would set me back a grand total of $355 (£220). Think I'll stick with the Bic.